Buying a gift to welcome a sweet new baby sounds like an easy enough task. Until you know there’s dozens of people buying similar gifts for the same precious new bundle of joy. Have yours stand out in the crowd with something stunningly hip from Friday’s Child. Talk about taking all of the guess work (and leg work) out of curating the perfect gift on the arrival of a new baby. the fabulous folk at Friday’s Child create exquisite baby gift sets and can even have it on its way to its destination the very next day. How’s that for incredible service? Choose from either unisex or gender specific sets, there are plenty of options under and around the $100 mark. Friday’s Child baby gift sets are packed in a custom made leatherette hat box, filled with the sweetest quality gear such as suede moccasins, organic wraps, dummies, toys, blankets and candles (just to name a few) – all equally funky as they are adorable. 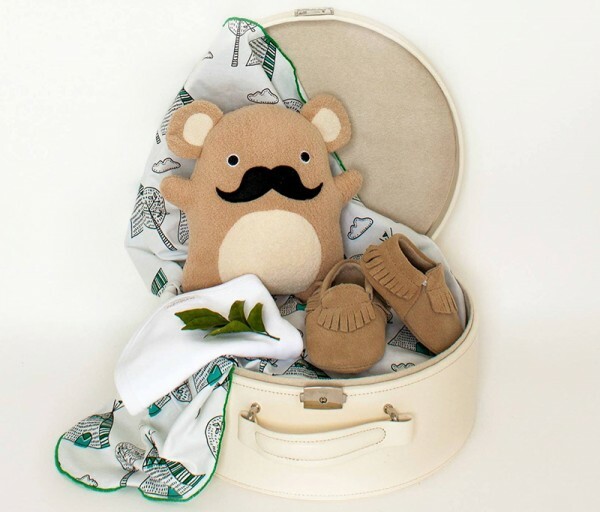 Friday’s Child baby gift sets are priced from a sweet $64.95 for the Elly Ballerina Baby Gift Box to a luxurious $229 for the amazing Mr Moustache Baby Gift Box.